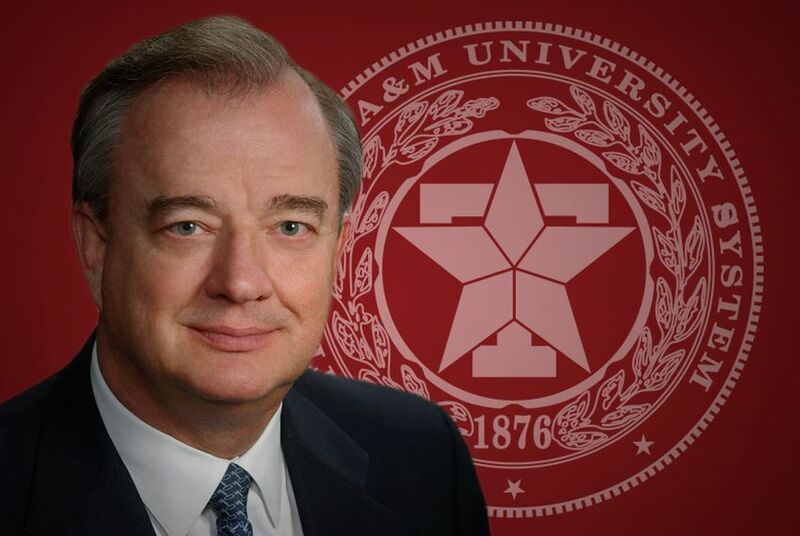 Texas A&M University System regents are expected to consider a contract extension for Chancellor John Sharp next week. A majority of the board says it supports the idea. Texas A&M University System Chancellor John Sharp's tenure in Aggieland is poised to last into the next decade. At its meeting next week, the A&M System Board of Regents is expected to consider extending the powerful, hard-charging chancellor's contract into 2023. He wouldn't receive a pay raise, according to a briefing on the meeting obtained by The Texas Tribune, but it would add three years to his current deal. The extension appears to be almost certain. The Tribune communicated with seven regents about the proposed extension on Friday. Five — a majority of the nine-member board — indicated that they support striking such a deal. At least two regents are opposed to the idea, however, setting up a potentially tense meeting next week. The proposed board action was submitted by board Chairman Cliff Thomas. He said in a brief that "Chancellor Sharp has provided excellent service to our System, and I recommend an extension of the employment agreement in recognition of that service, and to incent his continued service." In response to e-mailed questions from the Tribune, regent Tony Buzbee said he was troubled that Sharp's deal would be extended so early in his current contract. Right now, Sharp's terms run until August 2020. That deal was signed less than two years ago, when his base pay climbed from $507,000 to $900,000. Sharp's total compensation for this fiscal year is expected to be $1.3 million, according to a report filed with the Legislative Budget Board. "You never extend an employment contract when you are not even halfway into the contract, absent some compelling reason," Buzbee said. "This isn't good government. No one has provided any justification for this extension, despite my requests." Buzbee stressed that he is "casting no aspersions at the chancellor or his performance." "Honestly: I think we build too many buildings and raise tuition too often," he said. "But I don't lay that at the feet of John Sharp. He doesn't have a vote [on the board]." Buzbee also questioned the timing of the potential extension. The A&M System is awaiting Senate confirmation of one new regent, Midland oilman Tim Leach, who was appointed by Gov. Greg Abbott in January. And many lawmakers have expressed frustration with state universities in recent months for raising tuition and aggressively pursuing expansion. Multiple bills aimed at reining in higher education are making their way through the Legislature, including a proposal to freeze tuition that has already passed the Senate. "I would expect that in light of the tuition freeze and reducing funding, this extension would raise some eyebrows in Austin," Buzbee said. Regent Robert Albritton said he agrees with Buzbee that "there is absolutely no justification" for an extension at this time. The purpose of the board is to do what is best for the state, "not to enhance the comfort of our administrators," he added. Several other regents were more supportive of the idea. Regent Charles Schwartz said Sharp has "a clear majority of support on the board." "I think John Sharp is doing an excellent job for the system," he said. "I think some of the most innovative things in higher education are coming out of the Texas A&M University System." Schwartz also said he had no problem with the timing. If the board waited until after the current legislative session was over, it would risk being accused of not being transparent. That could cause the board to lose credibility with lawmakers. The legislative session ends on May 29. "I want the 181 members of the Legislature, the lieutenant governor and the governor to know that we are doing this while they are in session," he said. Thomas, the board chairman, also said he believed the timing is right. "The Texas A&M System is on an upward trajectory that we have never seen before in the System’s history," he said in an emailed statement. "We want to maintain the momentum that Chancellor Sharp’s leadership has provided." Board Vice Chairwoman Elaine Mendoza said Sharp "has shown he can take bold, difficult steps and make tough decisions." "That's the kind of stability, knowledge and leadership we need for these trying times," she said. "Stable leadership will give our system employees the confidence to address difficult issues. I was looking forward to discussing this item at the board meeting with my colleagues." Regent Judy Morgan called the A&M System "the system to beat in Texas." "It wasn't that way before Chancellor Sharp," she said. And Regent Phil Adams called Sharp an "outstanding" chancellor. "I wish we could lock him in longer," he said. Meanwhile, Regent Bill Mahomes was noncommittal. "I feel like the board should discuss these issues together at the meeting before we debate it in the newspaper," he said. "I just feel it is inappropriate to debate it in the media before the meeting." At least in some ways, however, Sharp has avoided some of the pressure that other universities leaders have faced in Austin this year. Some lawmakers have praised the A&M System's low overhead costs and pursuit of expanded enrollment. Sharp has at times been a divisive figure on the system's flagship College Station campus. But there's no question that he has made a huge mark on the system. Under his watch, A&M joined the Southeastern Conference for athletics, completed a major renovation of its football stadium, began working to double enrollment in its engineering school and announced plans to open a satellite teaching campus in McAllen. Sharp has also aggressively sought to reduce auxiliary costs by outsourcing many janitorial, dining and housing services. It's unclear whether waiting for Leach's confirmation would affect Sharp's standing on the nine-member board. In a Senate Nominations Committee hearing Thursday on Leach's appointment, Leach had positive things to say about the status of the system. He noted that system overhead is "astoundingly low" and didn't raise any problems with Sharp's pay. He compared executive pay at A&M to how he handles it at his business. "The good performers I have, I can't pay them enough money because they are so valuable to me," Leach said. "The real thing is to evaluate the ones that are not good performers and make sure they don't work for me any longer." Thomas, the board chairman, was also at the meeting seeking confirmation for his reappointment to the board. He agreed. "The market usually tells us what we have to pay these people," he said. "We understand that we are good stewards of the state of Texas and we have to work hard to get the value for everyone. "But the marketplace sets the value for our chancellors." Lawmakers want to rein in Texas universities — four years after gutting their oversight board. Pay is climbing fast for most Texas university leaders. Disclosure: The Texas A&M University System and Tony Buzbee have been financial supporters of The Texas Tribune. A complete list of Tribune donors and sponsors can be viewed here.